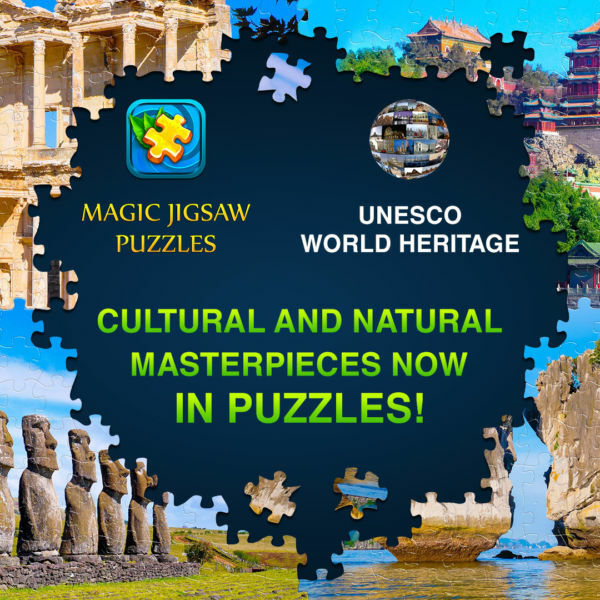 OUR PLACE World Heritage team up with Mobile Game Developer ZiMAD to introduce UNESCO World Heritage photographic puzzle series. Mobile users can now enjoy solving puzzles with photos of the world’s most valued cultural sites included into UNESCO World Heritage List. SAN FRANCISCO, April 18, 2018 – ZiMAD, an international game developer, has signed an exclusive partnership with OUR PLACE World Heritage to bring content from the first and only official UNESCO World Heritage photographic archive. The initial roll-out of content will consist of three puzzle sets Places of Power and Passion, Places of Magic and Mystery, Places of Wonder & Discovery. All three collections are devoted to International World Heritage Day, April 18, a day that celebrates the shared wealth of humankind and raise awareness about the diversity of cultural heritage and the efforts required to protect and preserve these important yet vulnerable places of universal importance. “We, the temporary custodians of the worlds cultural and natural heritage, have a duty to preserve and protect these valuable assets so we can pass them on to future generations to enjoy and appreciate” – says Geoff Steven, OUR PLACE CEO and supervising photo editor. ZiMAD has already signed a deal with major media enterprise National Geographic and launched a continuing series of puzzles collections from National Geographic photo archive which are of great success and widely enjoyed by the audience of Magic Jigsaw Puzzles. UNESCO World Heritage puzzle collections will be a suitable addition of high quality content. Exclusively curated and carefully selected by OUR PLACE World Heritage team, collections of high-definition photos will definitely appeal to more than 3 millions of Magic Jigsaw Puzzles monthly active users and will not only bring enjoyment to players but increase awareness about world’s most beautiful and valued cultural and natural assets. Players can look forward to additional content featuring UNESCO World Heritage photos on Magic Jigsaw Puzzles in the coming months. San Francisco based company, ZiMAD is an international developer and publisher of games for all major mobile platforms, social networks and desktop. The company’s portfolio includes Magic Jigsaw Puzzles, Bubble Birds and Dig Out! Launched in 2011, Magic Jigsaw Puzzles is the premier jigsaw puzzle app on iOS and Android devices, also available on Amazon, Facebook and in the Microsoft Store. With 50 million downloads and billions of puzzles solved, Magic Jigsaw Puzzles’ continues to challenge players by providing a constant stream of new content though fresh puzzle packs and licensing agreements with iconic brands. OUR PLACE World Heritage is a global photographic project which has been undertaking the important project of documenting and promoting the sites on the UNESCO World Heritage list through great original photography. Our Place has been granted Official Partnership status with UNESCO, and has worked closely with the UNESCO World Heritage Centre in Paris for the last 10 years. Our Place also has a close affiliation with IUCN (International Union for the Conservation of Nature). The OUR PLACE team of freelance photographers have currently photographed around 400 World Heritage sites in over 100 countries and OP has over 40,000 images in its exclusive archive. Our Place images are used in exhibitions, displays and publications worldwide. The aim of OUR PLACE World Heritage is to celebrate ‘our place on our planet’ through great and inspirational photography. OUR PLACE World Heritage team believes that good photography can inform and enthuse people about our shared global heritage, and hopefully inspire them to respect their own and others’ cultural and natural resources.